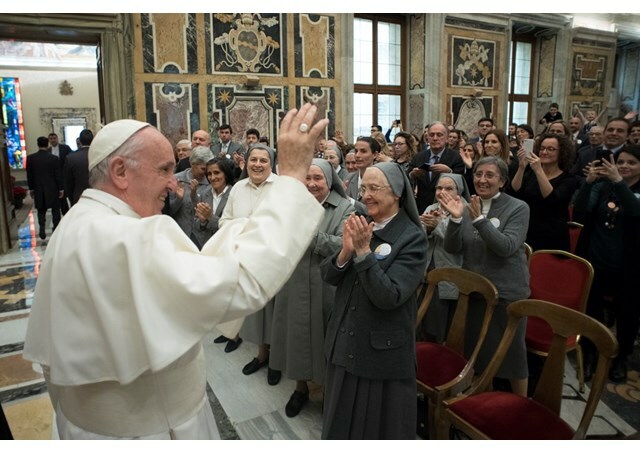 On Saturday, Pope Francis met members of the religious congregation founded by Mother Frances Xavier Cabrini: the Missionary Sisters of the Sacred Heart of Jesus. The congregation is present today on 6 continents and in 15 countries around the world. Mother Cabrini helped Italian immigrants living in the United States and she died in Chicago exactly one hundred years ago. St Cabrini was a true missionary. She had grown up keeping before her the example of St. Francis Xavier, the pioneer of evangelization in the East. In his heart he had China and in that distant land he hoped to bring the proclamation of the Gospel. He did not think of the thousands and thousands of emigrants who, because of hunger, lack of work and the absence of a future, embarked with their scant belongings to reach America, driven by the dream of a better life. As we know - and as she said - it was the vision of Pope Leo XIII who, jokingly, made her change course: "Not to the east, Cabrini, but to the West!". The young Mother Cabrini, who had just founded the Missionaries of the Sacred Heart, needed to see where God was sending her on mission. Not to where she wanted to go, but to where He had prepared the way for her, the path of service and holiness. Here is the example of a true vocation: to forget oneself in order to surrender oneself fully to the love of God. May the Lord renew always in you the attentive and merciful gaze towards the poor who live in our cities and our countries. Mother Cabrini had the courage to look into the eyes of the orphaned children entrusted to her, the unemployed youth who were tempted to commit crimes, the men and women exploited for the humblest jobs; and therefore today we are here to thank God for her holiness. In each of those brothers and sisters, she recognized the face of Christ and was able to put to good use the talents that the Lord had entrusted to her. She had a strong sense of apostolic action; and if she had such great energy to accomplish extraordinary work in a few years, it was only because of her union with Christ, following the model of St. Paul, from whom she took her motto: "I can do all things in Him who gives me strength".